Your schedules’ first day of the week: We recommend that you set this day to be the same as the your pay week. Default pause: The amount of pause given by default when creating a break on a shift. Default Labor Cost Objective (%): The ratio of Labor/profits you desire to respect. Is useful by using the labor cost calculator under the scheduler -> More -> Show projections. 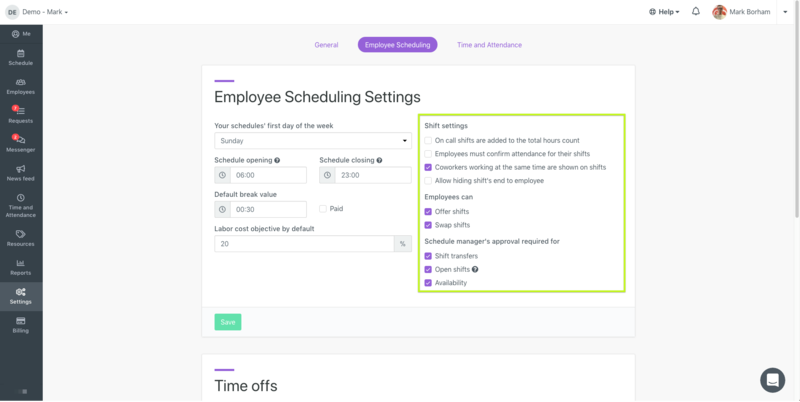 On call shifts are added to the total number of hours : This option will add the shifts under open shifts to the total of hours in the scheduler. Employees must confirm their attendance at shifts : Makes employees confirm their shifts. Will show as a check symbol in the scheduler. Colleagues working at the same time appear on shifts : Employees will see their colleagues working at the same time. Offer Shifts : Allows employees to give their shifts to others. Exchange Shifts : Allows employees to exchange shifts. Note : Employees can only offer and exchange shifts with employees that also have the position required as well as being available. This section lets you chose what employee actions need approval. If they are not selected, those actions will happen without notification to the manager. We recommend leaving each of the settings of this section activated to avoid abuse.